Astronomers have taken an important step toward establishing an upper limit to the masses of stars. Using NASA's Hubble Space Telescope, they made the first direct measurement within our Milky Way Galaxy, and concluded stars cannot get any larger than about 150 times the mass of our sun. The astronomers used the Hubble to probe the Arches cluster, the densest in our galaxy. The finding takes astronomers closer to understanding the complex star formation process. It also gives the strongest backing yet to the notion stars have a weight limit. "This is an incredible cluster that contains a rich collection of some of the most massive stars in the galaxy, yet it appears to be missing stars more massive than 150 times the mass of our sun," said astronomer Donald Figer of the Space Telescope Science Institute, Baltimore. "Theories predict the more massive the cluster, the more massive the stars within it. We looked at one of the most massive clusters in our galaxy and found there is a sharp cutoff to how large a star can form," he added. 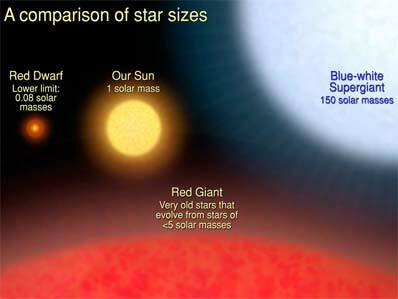 A star's weight ranges from less than one-tenth to more than 100 times the mass of our sun. Although astronomers know stars come in a variety of masses, they don't know if the bodies have a weight limit at birth. Knowing how large a star can form may offer important clues to how the universe makes them. Astronomers have been uncertain about how large a star can get before it cannot hold itself together and blows apart. Astronomers don't know enough about the details of the star-formation process to estimate a star's upper mass. Consequently, theories have predicted stars can be anywhere between 100 to 1,000 times more massive than the sun. Figer's finding is consistent with statistical studies of smaller-mass star clusters in our galaxy and with observations of a massive star cluster known as R136 in our galactic neighbor, the Large Magellanic Cloud. Figer used Hubble's Near Infrared Camera and Multi-Object Spectrometer to study hundreds of stars ranging from six to 130 solar masses. Although Figer did not find any stars larger than 130 solar masses, he conservatively set the upper limit at 150 solar masses. 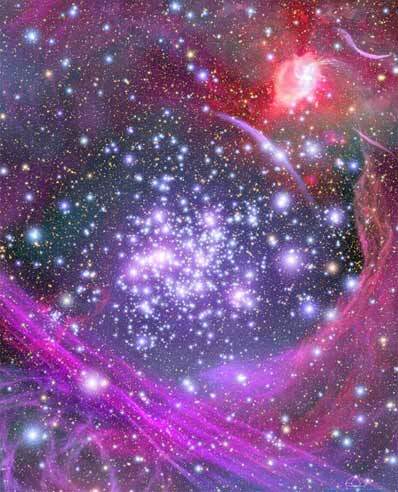 The Arches cluster is a youngster about 2 to 2.5 million years old. It resides 25,000 light-years away from Earth in our galaxy's hub, a hotbed of massive star formation. In this region huge clouds of gas collide to form behemoth stars. Hubble's infrared camera is well suited to analyze the cluster, because it penetrates the dusty core of our galaxy. It produces sharp images, allowing the telescope to see individual stars in a tightly packed cluster. Figer estimated the stars' masses by measuring the ages of the cluster and the brightness of the individual stars. He also collaborated with Francisco Najarro of the Instituto de Estructura de la Materia in Madrid, Spain. Najarro produced detailed models to confirm the masses, chemical abundances and ages of the Arches cluster stars. "Standard theories predict 20 to 30 stars with masses between 130 and 1,000 solar masses," Figer explained. "But we found none. If they had formed, we would have seen them," he added. Figer cautions the upper limit does not rule out the existence of stars larger than 150 solar masses. His next step is to pinpoint more clusters to test his weight limit. Several telescopes, including NASA's Spitzer Space Telescope, have been searching for new star clusters in the Milky Way.